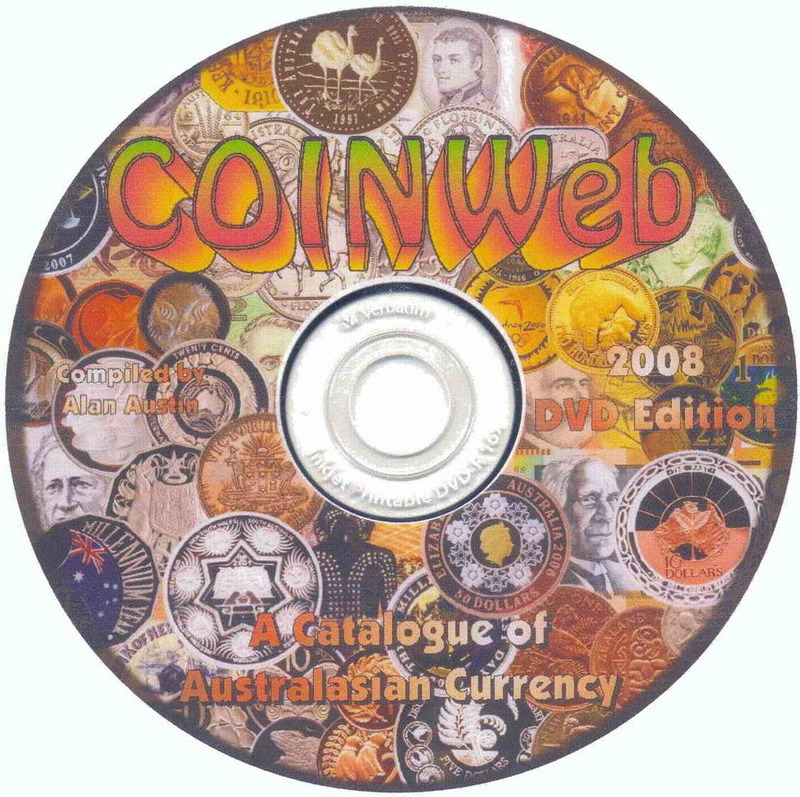 The most comprehensive catalogue of Australian, New Zealand and Principality of Hutt River coins, notes and tokens ever published, this is an absolute MUST HAVE for the advanced collector and the novice alike. It is the perfect and affordable gift to introduce a child, grandchild, nephew or niece to the fascinating world of numismatics. 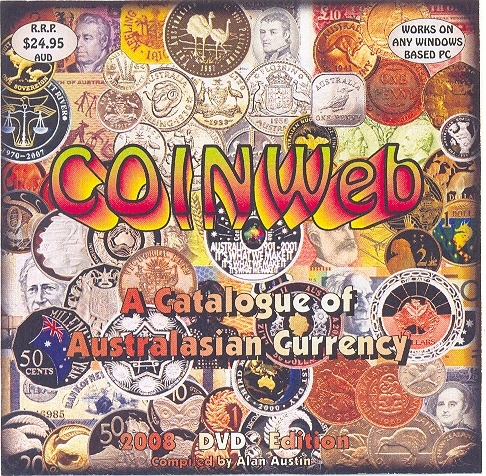 All currency items, from the coins carried by passengers on the First Fleet in 1788 to the most recent 2008 mint releases, are presented in an intuitive, logical and easy-to-navigate computer DVD. Insert the disc into your computer and you are away! 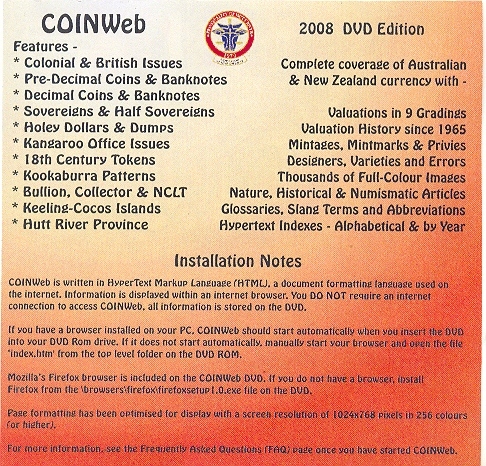 The DVD covers Colonial & British Issues, Pre-Decimal & Decimal Coins & Banknotes, Sovereigns & Half Sovereigns, Holey Dollars & Dumps, Kangaroo Office Issues, 18th Century Tokens, Kookaburra Patterns, Collector & NCLT Issues, Bullion Coins and even comprehensive coverage of the issues of the Keeling-Cocos Islands and the Principality of Hutt River. Recent valuations are shown in up to 9 grades along with a history of valuations for each item stretching back over 40 years. Mintages, mintmarks, privies, designers, varieties and errors are presented with thousands of full-colour images. Articles on the natural, historical and numismatic significance of issues provide a whole new perspective for the collector and non-collector alike. Glossaries explain numismatic and slang terms, demystifying the confusion of numismatic abbreviations. Navigate to a particular item alphabetically, by year or by denomination. Follow hypertext links forward and back from individual items to the collections in which they were released. You will spend hours fascinated by the encyclopaedia-like depth and breadth of coverage. The Royal Mint and HRH Prince Leonard have no hesitation in endorsing this excellent publication and are happy to make it available through the Royal Mint Sales Office and via the Royal Mint mail order form. All copies purchased via the Royal Mint of Hutt will bear the Grand Seal of Hutt on the inside of the disk case cover, as shown in the graphics alongside, to show it's origin. Hutt's latest mintings may be viewed by following the links. 01st June 2007 - Armorial Bearings Coin Set STOCKS ARE LOW! May Edition has to say!